Best Toy Design Award Winners! 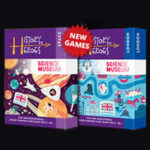 History Heroes card games are the Best Toy Design Award Winners! Thanks to Junior Magazine, History Heroes has won this year’s award from the magazine for Best Toy Design (category: 6+ years). We’re so thrilled that we’re celebrating by giving all customers free UK first class postage on all orders between now and the 31st December 2014. You’ll also find discounts for buying several games at once – perfect for presents, stocking fillers and party gifts.